Since 2002, polishedprices have been a leading provider of wholesale transaction-based diamond prices, indices and independent marketing reporting. 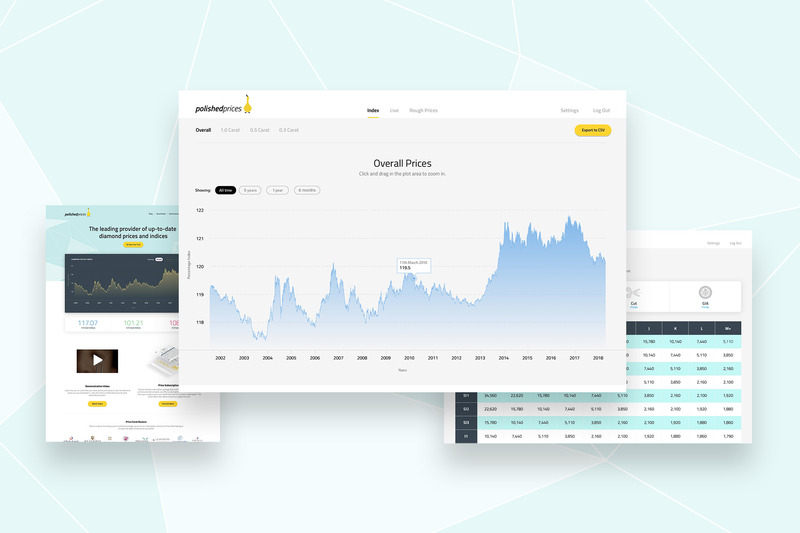 polishedprices provide their subscribers with daily up-to-date indices of prices and movements in the diamond market. polishedprices approached us with two technical issues. The first issue was that polishedprices website hadn’t been updated since 2002, and showed its age in looks and performance. For polishedprices to sell more subscriptions to their service, they needed a modern e-commerce website. The second issue was their price index. polishedprices required a new pricing index system that could audit all of the raw data and perform calculations to produce completely accurate figures in the price index. Due to the technical difficulty of this solution, polishedprices’s previous supplier was unable to carry this out. We worked with polishedprices to build a new e-commerce website and a new bespoke subscriber pricing index. We built polishedprices’s new e-commerce website in our custom CMS system, Cadenza. We built a number of technical functions including an e-commerce system for their subscribers, news and comment publishing, as well as market and index report publishing. We also built a number of functions into the subscribers area, including prices tables, a market news section and a users accounts system, so that subscribers are able to maintain their subscriptions. As we didn’t have the code for the polishedprices previous tool, we had to go back to the first principles and rework it from their original excel spreadsheets method. polishedprices’s price index system performed a series of very complex functions. Firstly, it calculates the average diamond price from the actual transactions that are inputted into the system. The system then displayed the diamond prices over the past year on a pricing page. The pricing page displayed several matrices of data, including the prices by colour and quality. Each of these figures is then backed up by a complex web of historical data. At the time polishedprices’s statistician calculated these values using a number of excel spreadsheets – a time consuming and difficult process. Using Cadenza we had created a new system that performed the same calculations as the previous Excel system and audited them to ensure that there was no error in the system or database – which contained over 1.8M price records, with over 2,000 added per week. To reduce processing when calculating indices, an intermediate table is maintained in the price index, which contains the latest normalised price and transaction date for the values of shape, size, clarity and colour. The process of generating a new table of records is carried out at the time of price upload, between midnight and 10 am on the day following the transaction date of the batch of prices uploaded. If any of the figures that are generated in this process disagree with the calculations made using the Excel spreadsheets, polishedprices can see this in the backend of their tool and amend it. Ready to become our next e-commerce website success story? At Artonezero, we create e-Commerce websites and mobile applications that build user-engagement, increase new customer sign-ups and help organisations retain their customer base. If you would like to discuss your e-Commerce website, book a callback today and one of our in-house experts will be in touch to discuss your project requirements.